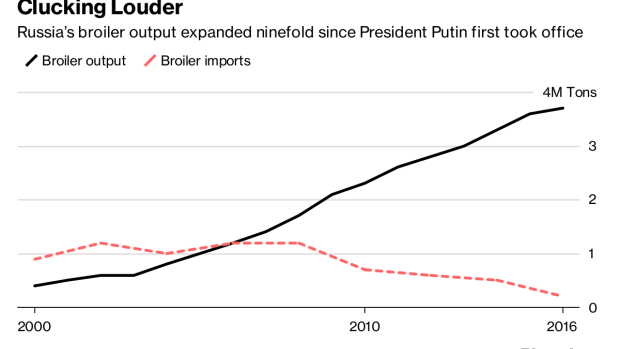 (Bloomberg) -- Vladimir Putin is breathing new life into the chicken that kept Russians fed in the dying days of communism. The project is a hedge against potential U.S. food sanctions and a challenge to the two western breeders that supply all of the nation’s commercial strains. But then the Soviet Union imploded, funding vanished and westerners with more advanced genetics swooped in, driving the bird to the brink of extinction. A subsequent series of international mergers and acquisitions left Tyson Foods Inc.’s Cobb-Vantress unit and German EW Group’s Aviagen in charge of the industry from their respective headquarters in Arkansas and Alabama. For Putin, so much meat power in so few foreign hands is an unacceptable security risk, according to two officials involved in sanctions planning. And it’s not just chickens Putin and his advisers are worried about. Russian growers of beef, pork, potatoes and even sugar beets, the country’s main source of sweetener, are also dependent on genetic inputs from the U.S. and Europe.